Syndesi Therapeutics is developing molecules which act through a novel mechanism to modulate synaptic transmission – the communication between neurons in the brain. Synapses are the connections between neurons and synaptic dysfunction, with the consequent disruption of connectivity between brain regions, underlies the cognitive and psychiatric symptoms of Alzheimer’s and other dementias. By modulating the way transmission of signals occurs at these connections, our aim is to improve cognition in a meaningful way for patients with conditions such as Alzheimer’s disease and other disorders with cognitive impairment. Our molecules act in a unique way on the synaptic vesicle protein SV2A. SV2A plays a central role in synaptic transmission, by regulating the release of neurotransmitter. Syndesi has an exclusive license to its molecules and technology from UCB, the leading company in SV2A research. UCB developed two major marketed products that modulate SV2A, the anti-epileptic drugs levetiracetam (Keppra®) and brivaracetam (Briviact®). 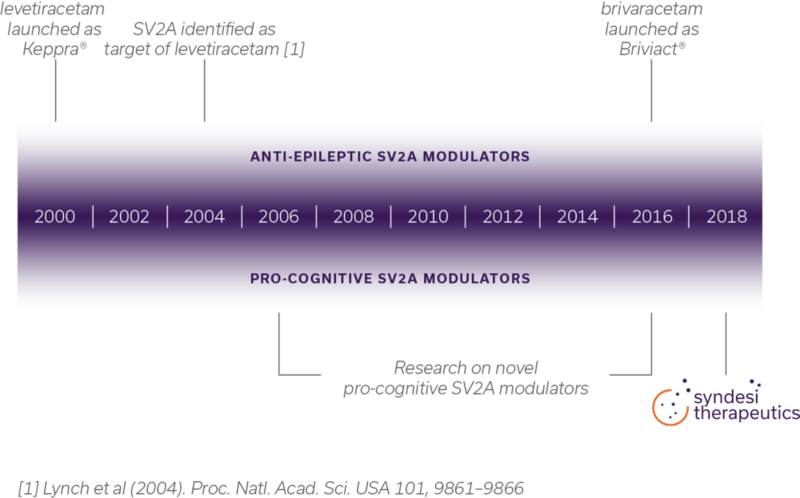 Syndesi’s procognitive SV2A modulators regulate the function of SV2A in a distinct manner, showing pro-cognitive but not anti-epileptic properties in preclinical models. © Copyright 2018-2019 Syndesi Therapeutics SA.